He went on to blame the protesters and rebels for the killings at the central Syrian town of Houla two Fridays ago, saying it was the work of ‘monsters’. In contrast, a defecting Air Force officer, Major Jihad Raslan, has told the Western press that he saw Syrian army soldiers give cover to the pro-regime Shabiha thugs who carried much of the massacre in the city, which is a stronghold of opposition to al-Assad. Raslan’s account is corroborated by satellite photos published by the BBC last week. 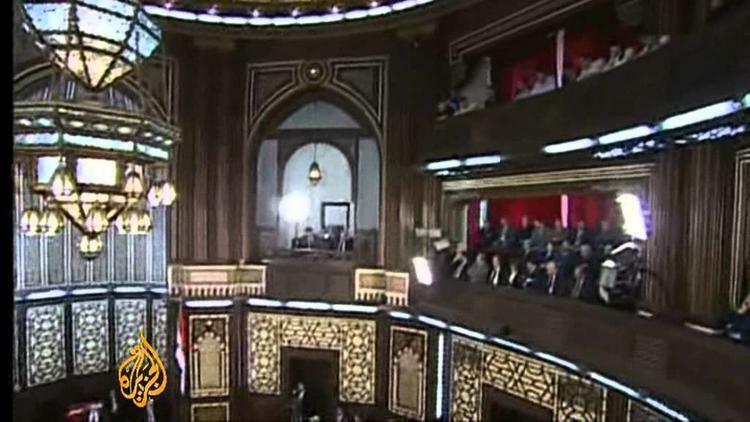 By his speech in parliament, al-Asad spelt the end of political process of settlement of the internal Syrian conflict, director of the Centre for the Analysis of Middle East Conflicts Aleksandr Shumilin believes. (Shumilin, voice recording) It is clear that this sort of unreasonable assessment of the events will only aggravate the situation, and will, incidentally, serve to justify the opposition’s move to tougher measures, military measures of putting pressure on the regime. They may now start to unite and move towards military plans of in effect ousting the regime. In these efforts, they may well get the support of the Arab countries – not only of Saudi Arabia and Qatar, which are currently at the forefront of putting pressure on Syria, but also the majority of member states of the Arab League.